Sometimes I find myself dispirited, unsatisfied with my writing and wondering whether I should waste my time with it at all. It is not likely that it will ever find its way into the public eye, and even less so that it will have any sort of effect on the world. After all, there are thousands upon thousands of other would-be novelists and poets out there. The practice of writing becomes a rather egotistical undertaking when one considers the multitudes of hopeful writers there are. What right do I have to assume that I have something more important to say than they? The answer, of course, is none. I am fully aware of this, but I continue to write; this leads me to wonder what my real motivation is for writing. Seeing as I have already given up on changing the world with my work, I can assume that it is a more selfish, personal reason. This could be any number of things: to express myself, to communicate my ideas, for the simple joy of stringing together words on a page. George Orwell’s essay “Why I Write” details what the author asserts to be his motivations for setting pen to paper. First, Orwell explains to his reader that he has had a penchant for writing since he was practically a toddler. He admits that he was a lonely child, and that writing came as a kind of remedy to his loneliness. 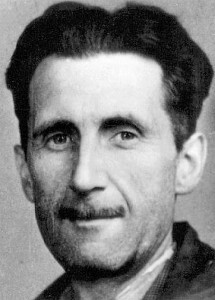 Orwell was constantly composing stories in his head, as he puts it: “I was carrying out a literary exercise of a quite different kind: this was the making up of a continuous ‘story’ about myself, a sort of diary existing only in the mind.” This is certainly familiar to me, and I’m sure to many who feel the need to write. I remember being a small child, bored at a restaurant and one of the only children in a room full of adults. A waitress bent down and asked me cheerfully what my name was. “Emma, said Emma,” I quickly replied, accidentally vocalizing the story I’d been internally writing. These are all very fair and seem to cover most of the reasons for writing that I can imagine. Indeed, Orwell asserts that every writer embraces these objectives to some extent. Clearly there is something else, some indefatigable impulse that forces us to write, and write again. The temporal lobes, in case you were wondering where the culprit resides. This would perhaps explain Orwell’s need to write from a young age; his self-described loneliness could certainly be seen as injury in his adolescence. It might be the cause of his mystery compulsion and my steadfast, illogical desire to write. It might be a hard concept to accept− that my writing is more chemical reaction than noble purpose. On the other hand, it is rather amazing to think that authors such as Dostoevsky and Orwell not only wanted to write, but were compelled to by their own brains as if by an outside force. It lends their stories an element of inevitability and fate. What do you think? Why do you write? Check out Elise Petracca’s “Why We Write” below! It deals with a similar topic and might be interesting to read with Flaherty’s ideas in mind. I ask myself the question “why do I write” all the time. The answer–I have no idea. At times writing is like pulling teeth, slow and excruciatingly painful. And many times I am unhappy with the finished product. But there is, like you said, that “indefatigable impulse” to keep writing because every once in a while we surprise ourselves and create a work that we are proud of, which makes the whole process worthwhile. It’s a high–writing the piece that you’re proud to put your name on. I agree with the argument that writing can be a chemical reaction, for there’s something cathartic about the practice. Writing nonfiction thoughts or musings, as well as fiction pieces, are a way to express our inner selves. The feeling we get after the chemical reaction–the writers’ “high,” if you will–is the outside force that I think drives us to continue writing, even when it is like pulling teeth to get words on the paper.